Vietnam’s scenery may be the star of blockbuster Kong: Skull Island, but the country’s real-life Monkey Island hosts the saddest show on earth. 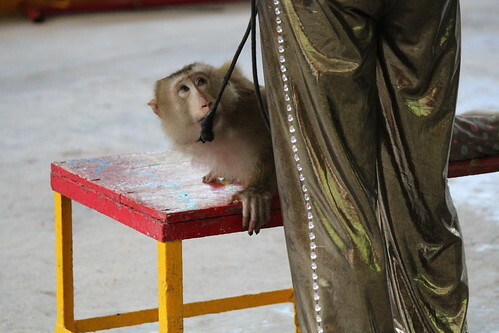 A UNESCO-accredited national park in Vietnam continues to force monkeys to ride bikes and dogs to jump through flaming hoops despite being asked to end the cruelty by Animals Asia. The Can Gio Bioreserve in southern Vietnam is a natural haven for wildlife including thousands of macaques which freely roam the extensive area of sprawling mangroves, rivers and forests. 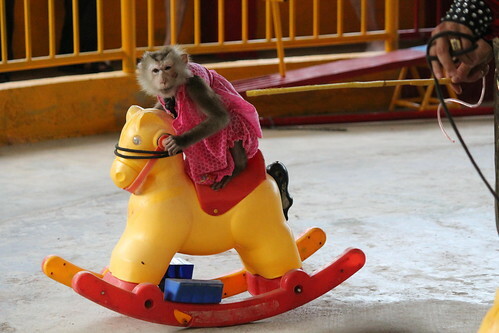 But despite being tasked with protecting the area and educating the domestic and international tourists who flock to the pristine beauty, the Can Gio management board have chosen to host an animal circus on the reserve’s so-called Monkey Island. This animal circus forces dogs to jump through hoops of fire while humiliating chained macaques by making them dress up and ride bicycles. The cruelty would shock animal-loving Kong: Skull Island star Samuel L. Jackson (see below). The movie is proving a massive hit with audiences across the world after it was filmed in Vietnam. It has enjoyed takings of almost $400 million despite only being released last month. Its star, a giant gorilla was filmed using CGI techniques, with no animals hurt during production. And Vietnam has taken Kong to its heart with even the suggestion that a statue is erected in his honour in Hanoi. However, while Skull Island is a blockbuster fantasy, Monkey Island’s animal circus is real and its cruelty is a nightmare for the macaques forced to perform there. Yet, nearly six months on, the saddest show on earth continues to shock and baffle visitors at the Can Gio Bioreserve. When Animals Asia contacted the Can Gio Bioreserve on the issue, the animal welfare NGO received a reply from the Cu Chi Historical Tunnel Complex, the agency which manages Monkey Island. “Through the performances we are sending the public a message that they should respect nature and animals, and that animals are friendly to humans. “The performing animals are all well taken care of, with special treatment and gentle training, without beating, and abuse during training or performances. Having given both UNESCO and Can Gio a very reasonable period of time in which to end the cruel performances, an Animals Asia inspection in March 2017 discovered that this outmoded form of entertainment continues. “We’ve been more than fair with both Can Gio and UNESCO giving them ample time to end the animal abuse being carried out at their facility, but it seems neither institution is willing to do so without public pressure. “This is so clearly not education – this is exploitation of the cruelest kind and it must stop. These performances tell our children that wild animals are here for our entertainment, to be dressed up, forced to do unnatural tricks and laughed at, while no regard is given to what is best for the animals. Animals Asia has launched a petition asking animal lovers across the world to join them in condemning cruel animal performances at the UNESCO-accredited institution and requesting Can Gio and UNESCO put an end to the performances immediately. 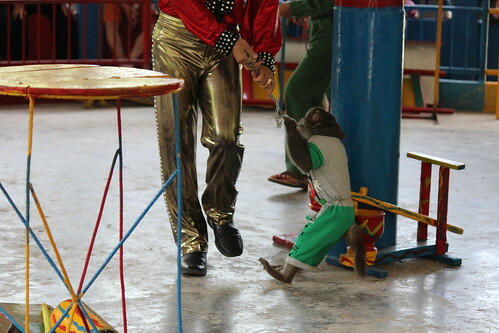 The welfare of captive wild animals used in circus performances is widely acknowledged to be severely compromised by their training, performances, poor living conditions, and in a number of cases their capture from the wild. In order to carry out the degrading and unnatural tricks seen in a circus show, an animal usually must first suffer physical abuse – often with the use of whips, metal bars, and bull hooks. The use of dominance, fear and in some cases abuse to train animals is likely to negatively affect both short and long-term welfare. Animals such as macaques do not choose to perform – they are forced. This can be clearly seen in the performances at Can Gio Bioreserve. The animals repeatedly try to escape the ringmasters who pull them into position using the metal chains which are constantly tied around their necks. When the show stops, the animals are likely kept in completely unsuitable environments. They will have no opportunity to carry out natural behaviours such as foraging or interacting in social groups. Keeping intelligent, social animals like macaques in this kind of limited environment can lead to lower life expectancy and abnormal behaviour such as increased aggression, self-injury and stereotypic (repetitive) behaviours. And for the audience, nothing has been learned. Animal circus has no educational benefit whatsoever. In fact, it has the opposite affect, giving the false impression that animals are here for our entertainment and that they take part in activities which are completely unnatural to them and would never be performed in the wild.